Snow, blowing snow, sleet, and ice can make winter driving an adventure. Take the following precautions to more safely navigate the roadways. 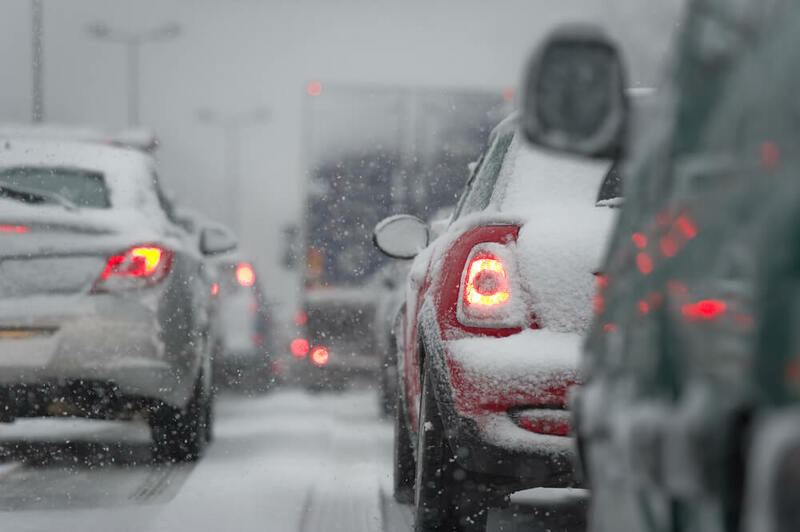 Avoid driving on bad weather days if possible, but if you must head out, clear your hood, bumpers, and all lights of snow. Visibility and making your intentions known are paramount. Also, clear your entire windshield, rear window, and side windows of snow and ice. Clean snow and ice accumulation off your roof, too. Slabs or chunks of snow and ice can fly off and endanger those behind you—trucks are even more problematic. The driver following you may be temporarily blinded, swerve to avoid the snow/ice, or have their windshield shattered. Some states levy fines for driving with roof accumulation—and higher fines when injury or property damage is involved. You could be subject to civil liability as well. Posted speed limits are intended for ideal road conditions. You can be well under the speed limit but still be driving too fast for conditions. The National Safety Council recommends a three-second following distance in good driving conditions. Double that, at least, in inclement winter weather. Antilock brakes should not be pumped. Maintain steady pressure when braking in snow and ice. “Regular” brakes should be pumped to avoid skidding. If your car begins to fishtail, steer in the direction you want to go. Stay at least six car lengths behind an operating plow and move away from the center line when one is approaching. Winter conditions present unique driving challenges. If you’ve been injured by another driver’s negligence, contact an auto accident attorney to protect your rights.